Join Ipanema’s ‘Spoil Your Sole in Rio Carnival’ Promo! Are you a travel buff? Would you like to go to Rio de Janeiro, Brazil for free? You can make your wish come true if you’ll join Ipanema’s ‘Spoil Your Sole in Rio Carnival’ promo. Yes, you heard that right! You might be the lucky Pinoy who will fly to Brazil with a friend to enjoy a week-long trip of a lifetime to join one of the grandest and most colorful festivities in the world, the Rio de Janeiro Carnival in Brazil. If you love to travel and soak in the sun, then go and get your favorite Ipanema pair now from any of the participating stores nationwide and join ‘Spoil Your Sole in Rio Carnival’ promo where you will be treated to 7 days and 6 nights VIP tour package exploring the 2-day Rio de Janeiro Carnival, visits to the Sugar Loaf Mountain, Corcovado, the Petropolis with a total of USD1,000 pocket money. 1. Purchase any pair of Ipanema Slippers from any participating store nationwide. 2. Buyer will be given a printed promo code upon purchase. 3. Keep the promo code and your purchase receipt safe and in good condition. 4. Go to www.facebook.com/IpanemaPhilippines to join the promotion. 5. 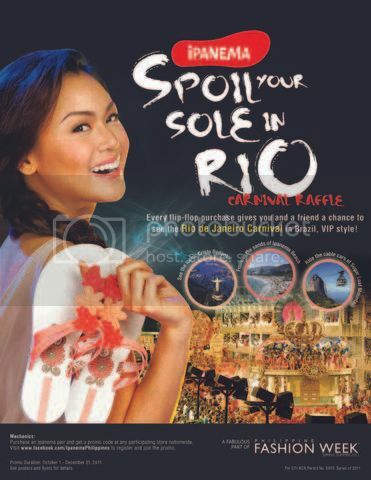 On Ipanema Philippines’ wall, you will see the Spoil Your Sole in Rio Application. Click like to be able to enter and navigate within the application. 6. To join, Click ‘Submit Entries’ and fill up the information requested. 7. Simply click ‘Add entry’ for another field for Promo Code and Store in case you bought more than one pair. 8. Click ‘Submit’ to submit the entry or ‘Cancel’ if one is cancelling the participation. 9. If the system receives the entry, the screen will indicate it via a ‘Thank you, we received your code’. 10. In the event that participant bought another pair or more at a different time within the promo period, he/she has to complete the information again. 11. Elro Corporation will shoulder the prize tax. 12. One pair of Ipanema purchased is equal to one printed promo code. 13. One promo code is equal to one raffle entry. 14. Deadline of submission of promo codes is on December 31, 2011 at 11.59PM. Promo starts on October 1, 2011. The raffle winner will be drawn on January 3, 2012. For more updates on the promo, join Ipanema’s official Facebook Page at http://www.facebook.com/IpanemaPhilippines. You may also check out the nearest store near you at http://ipanemaphils.com. This entry was posted in Ipanema. Bookmark the permalink. 2 Responses to Join Ipanema’s ‘Spoil Your Sole in Rio Carnival’ Promo! I’m going with my nanay..